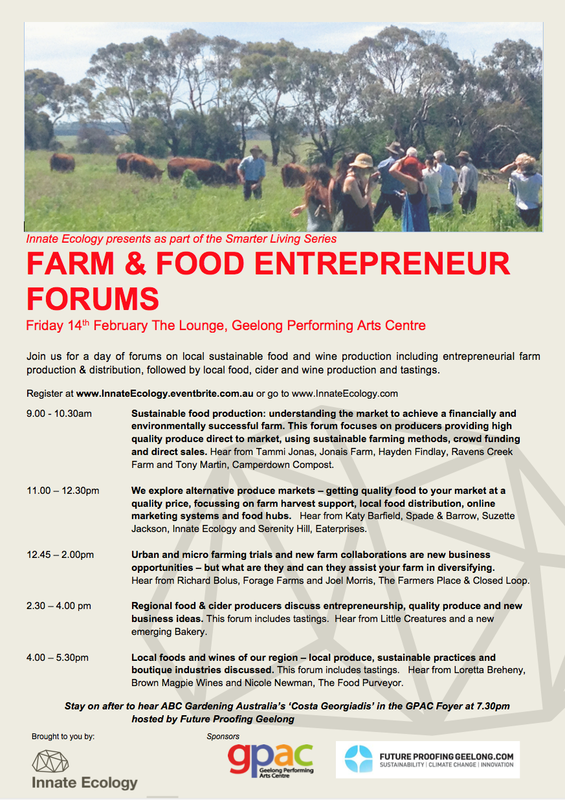 At Innate Ecology we are very pleased to bring two days of forums to regional community in the Sustainable Living Festival Geelong 2014. 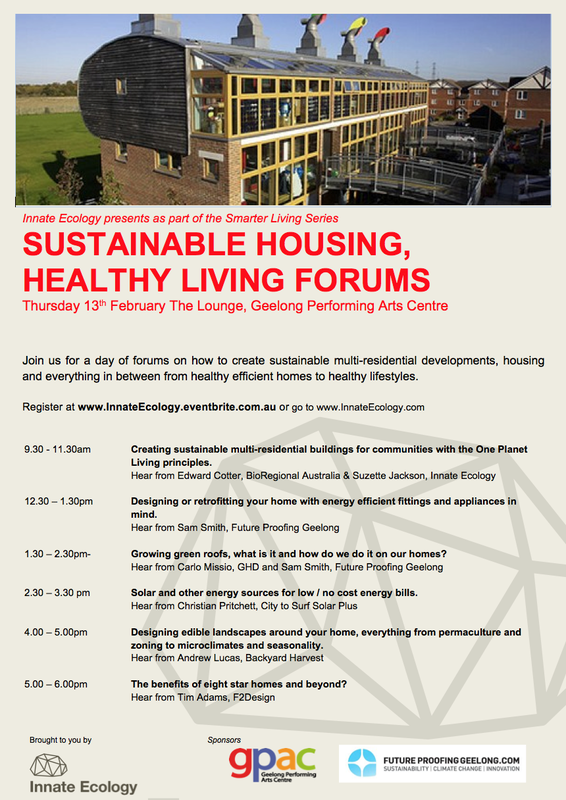 A full day of ‘Sustainable Housing’ forums will be held at The Lounge in the Geelong Performing Arts Centre on Thursday 13th February 2014. Following this on Friday 14th February we will host a full day of forums on Farm & Food Entrepreneurs, ending with conversation and tastings with local producers. Stay on at the Geelong Performing Arts Centre or catch an early dinner and be back for the Future Proofing Geelong feature talk with Gardening Australia’s host Costa Georgiadis at 7.30pm in the foyer. We are very excited about the expertise and information that will be shared at these two days of forums by local and regional specialists. to promote sustainable multi-residential development using the One Planet Living principles referred to in the City of Greater Geelong Environmental Management Strategy (currently out for public comment). to provide information that supports people making their homes more sustainable and in the process healthy. Specialists explain how participants can incorporate ideas into their own homes whether a retrofit or new and how to access local experts. We attended Friday mornings forums on Sustainable food production, Alternative produce markets and Urban and micro farming trials. It was a fantastic morning with some great speakers. Very good to see some of the innovative ideas that are happening around these topics. We walked away with lots of food for thought and fresh ideas. It was great to have so many inspirational speakers and participants at these forums. We hope to see the Geelong region shift into more regenerative farming and local produce distribution. Goodd article. I certainly love this website. Thanks!